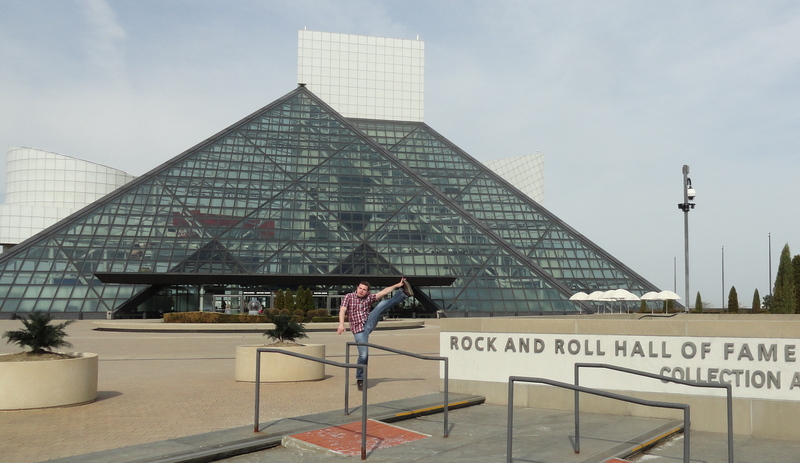 Last spring we stopped in Cleveland on our return trip from Washington, DC. With a variety of good eating and drinking options and quality museums, Cleveland made for a nice overnight stop to break up the drive. We arrived on Easter Sunday, not realizing how much would be closed – something to remember when planning future trips. We still found some tasty pub fare and home-brews at the Market Garden Brewery in the Ohio City neighborhood. The next morning we grabbed coffee and pastries at Phoenix Coffee Company, a local chain of coffee shops, and headed to the Rock and Roll Hall of Fame and Museum. With its expansive collection of artifacts and interactive displays, this museum is a must for any music lover! The self-guided exhibits are organized chronologically, covering the last century of music in the United States. Although you could stay here all day, allow a good 2 to 3 hours to explore the museum. After a brief walk around the downtown area we headed to the Greenhouse Tavern for lunch (including some outstanding poutine!) before setting off for Chicago. A mere 10 miles from Cleveland lies Cuyahoga Valley National Park, which we visited in August 2010. Had we had more time we would have loved to return there for a brief hike. This entry was posted in High Kick Photos and tagged Cleveland OH, Cuyahoga Valley, Greenhouse Tavern, High Kick, Rock and Roll Hall of Fame. Bookmark the permalink.